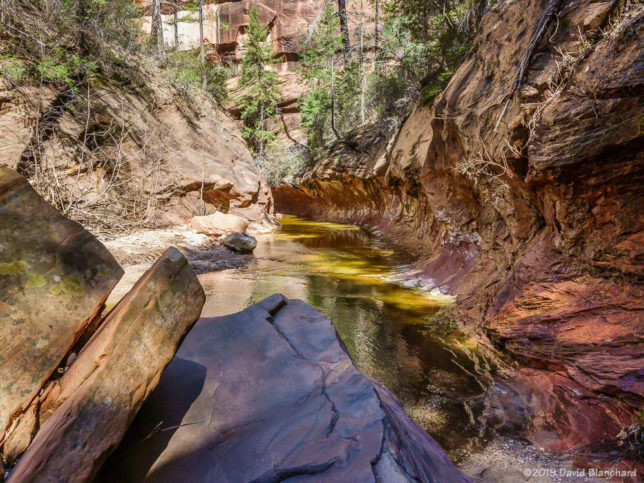 It’s only the second week in April and that is still early in the season for hiking up West Fork of Oak Creek. There are numerous water crossings along the 3.3 mile maintained trail; these are usually easily crossed on stepping stones or small logs placed across the stream. Beyond the maintained trail, however, there are several water crossings that are simply too large for stones or logs and one must wade through the water. 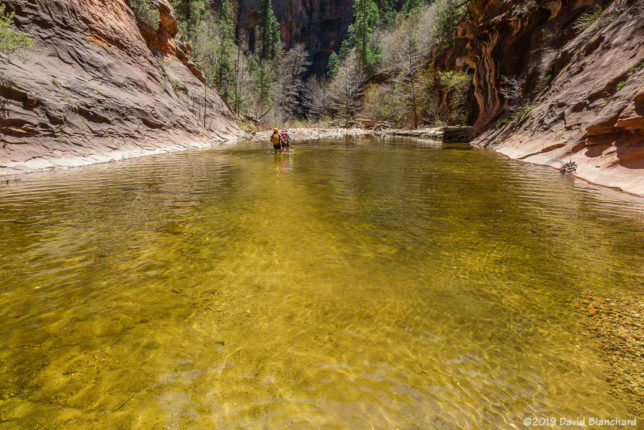 This early in the season the water is still chilly—and there was even some residual snow in the shadier parts of the canyon. We were especially interested in learning how the canyon had fared during the heavy rain events that occurred in January and February. Flagstaff, for example, received three times its normal precipitation (6.51 inches vs 2.16) in the month of February. 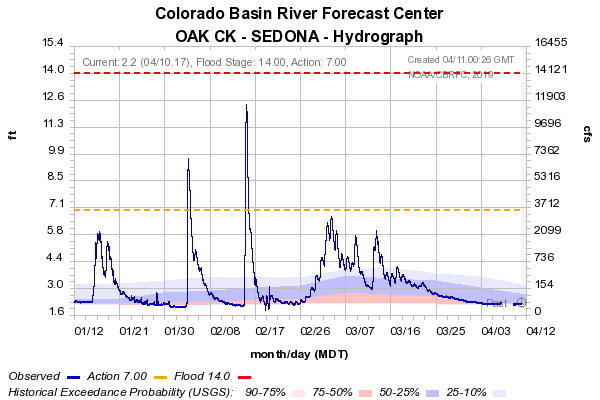 And there were other periods of above normal flows in Oak Creek; e.g., mid January, early February, mid February, and an extended period in March that corresponded to snow melt at higher elevations. USGS gauge data for Oak Creek showing several high flow periods this winter. Our interest ties back to the Slide Fire that occurred in this area in May 2014. In the aftermath of the burn, heavy loads of silt and ash flowed from the higher elevations and into the canyon. 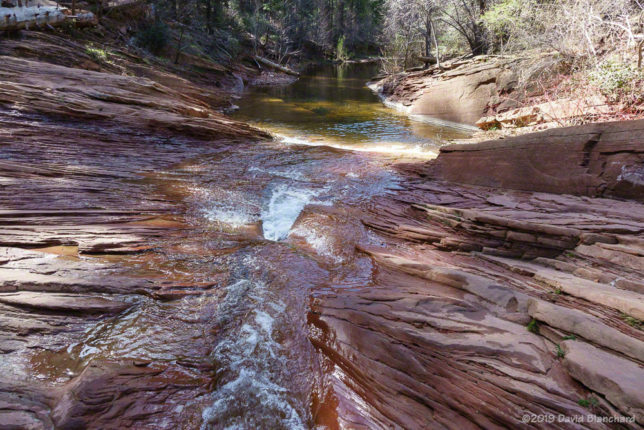 This turned a beautiful canyon with deep pools in the sandstone into a ash-blackened, silt-filled creek. For those who have long cherished the beauty of this canyon the results of the fire were heartbreaking. Silt and ash have been flushed from this swimming hole in West Fork Oak Creek. But we knew that, in time, rain would scour out the ash and silt and return the canyon to its former pristine self. But normal rains were simply not enough to accomplish this. This would require sustained above-normal amounts of water. 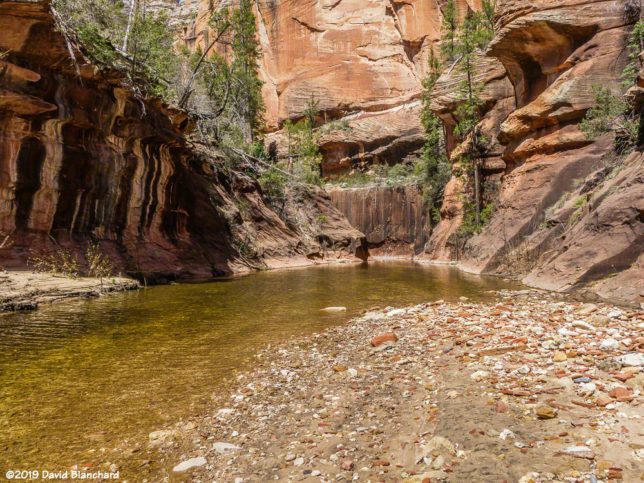 We traveled up the canyon in early January but, even then, most of the silt from 2014 was still there. But the heavy rains were about to start. Another narrow section of West Fork Oak Creek that has been cleansed of silt and ash. This large pool was filled with silt after the fire. Now it is finally clear again. We were very happy to find that the heavy rains and runoff had finally cleared the canyon of silt and ash. Black, muddy shores and beaches were cleansed and replaced with deep, light-colored sand. 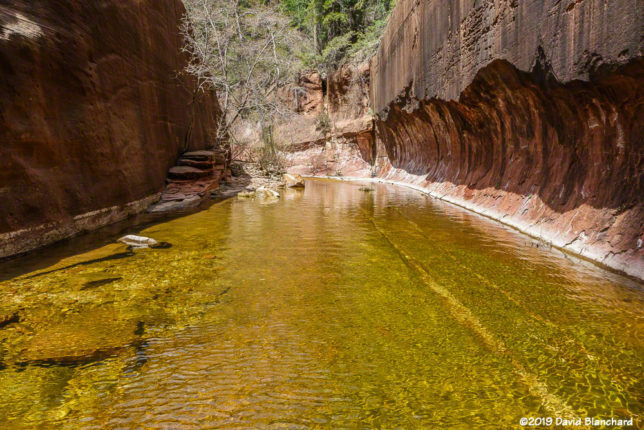 Silt-laden pools were scoured out back to the sandstone bottoms and filled with beautifully clear water. Large pool in West Fork Oak Creek. The canyon had finally recovered from the aftermath of the Slide Fire.